In November 2014, the Obama administration announced the Deferred Action for Parents of Americans and Lawful Permanent Residents (DAPA) program, which would protect from deportation and provide eligibility for work authorization to as many as 3.6 million unauthorized immigrants, according to MPI estimates. Unauthorized immigrants who are parents of U.S. citizens or lawful permanent residents (LPRs) would qualify for deferred action for three years if they meet certain other requirements. The Supreme Court in April 2016 is expected to hear arguments in the administration’s appeal of a lower court order blocking implementation of DAPA and a related expansion of the existing Deferred Action for Childhood Arrivals (DACA) program. The justices’ decision in the case, which began when Texas and 25 other states challenged the president’s authority to create the DAPA program and expand DACA, is expected in June 2016. If the high court permits DAPA to go forward, the program has the potential to improve the incomes and living standards for many unauthorized immigrant families through protection from deportation and eligibility for work authorization. Click here to access estimates of unauthorized immigrant populations by top states and counties, including numbers of those potentially eligible for deferred action via DACA and/or DAPA. 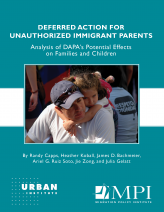 This MPI-Urban Institute report describes the population of 3.6 million unauthorized immigrant parents potentially eligible for DAPA and the likely impacts of the program on potential recipients and their children. The report finds that more than 10 million people live in households with at least one potentially DAPA-eligible adult, including some 4.3 million children under age 18—an estimated 85 percent of whom are U.S. citizens. As the report finds, DAPA could lead to reductions in poverty and other measurable gains for millions of people living in DAPA households. Providing work authorization for these unauthorized immigrant parents could raise the average DAPA family's income by 10 percent. Despite very high male labor force participation, the poverty rate for DAPA families is 36 percent, compared with 22 percent for all immigrant families, and 14 percent for families with U.S.-born parents. Furthermore, although most of the potentially DAPA eligible are not considered an enforcement priority under current Department of Homeland Security guidelines, the fear of deportation is ever present in these families. Beyond shielding children and families from potentially substantial economic harm resulting from the deportation of the father, deferred action would alleviate the documented psychological, social, and developmental harms associated with having an unauthorized parent. Among other findings: The potentially DAPA eligible are well settled with strong U.S. roots, with 69 percent having lived in the United States ten years or more, and 25 percent at least 20 years.